XpertMart™ stores all of your data in a relational database. The database is called relational because information is stored in different tables and these can be related to each other through a number of fields. 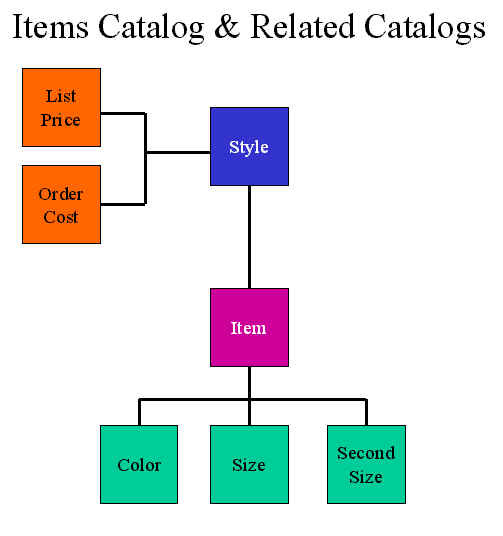 (Each Catalog in XpertMart™ is in fact a table in the database). Older databases were called flat file databases because they stored data in horizontal columns and rows in a single place. Usually, the datum in a flat file database are only connected by a single field such as an ID or Key field. You can imagine a flat file database as being something like an Excel spreadsheet whereas a relational database is more like a web site with hyperlinks that do not have to follow a hierarchical pattern. Naturally, the relational database offers far greater flexibility in both storing and retrieving information. It is important for you to understand the difference and keep it in mind as you begin to enter data into XpertMart™ and later look to make queries to the database and run reports. With older, flat file databases, it was often common to have to cram a lot of information into a single field. For example, a single field such as a style code usually contained multiple pieces of information incluiding the style, the size, the color and the price. When you use XpertMart™ it is no longer necessary to cram all of this data into a single field since related information can always be derived. 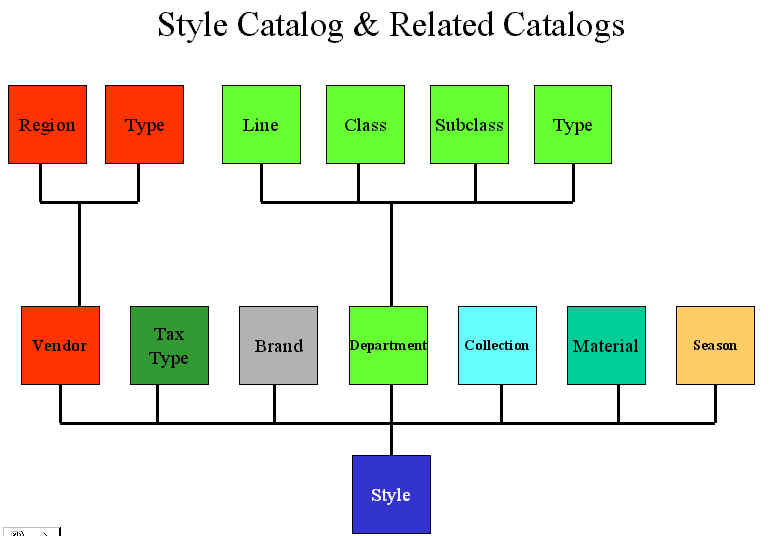 Consider the case of the Items Catalog and how it relates to some of the other catalogs in the system. Every item in the items catalog has a color that links it to the Colors Catalog and a size that links it to the Sizes Catalog. The item "belongs" to a Style; it is through this relationship that we can derive other information about that Item. Just as the Item can be said to "belong" to a Style, the Style also "belongs" to a Vendor. Notice that while vendor information is not stored anywhere in the Items Catalog, you are still able to identify an Item with a Vendor because the two pieces of information are related to each other, in this case via the Style. Similarly, you can derive an Item's Brand, the Line it belongs to and the Tax Type it falls under. The relational nature of the data becomes truly powerful once you being ringing-up sales. Whenever you sell an item, XpertMart™ records the sale of that particular item. But because that item is related to so many other pieces of data, that sale also affects them. So at the end of the day or week or month, you can see not only how many of a particular item were sold, but you can also see the total sales of that particular Style (by aggregating all Items that belong to the Style) and, by aggregating all Styles that belong to the same Vendor, see the total sales of that Vendor. This is a very simple example to illustrate an important point: whenever you make a sale, you are storing multiple pieces of information. How many pieces of information depends on how richly you fill in your Catalogs. But selling one Item can "answer" more than 40 questions: what color was it? what price was it? what store was it sold in? who sold it? when? in what size? what was its brand? who is the vendor of the item? what region does that vendor belong to?...and on and on. All of these answers are stored in the database every time you make a sale. Therefore, we like to call the POS the Point of Statistics as much as it is the Point of Sale. It's not just money that is being exchanged at the POS, it's information. And in the long run, the information you are capturing can prove to be more valuable than the money because, if you use it correctly, it will be the key to many future sales. So, if you are not pressed for time, take advantage of as many of the fields in the Catalogs as you can. They will help you better understand your business.